The Canadian military is expected to formally apologize for including the Mohawk Warrior Society in a draft version of its counter-insurgency manual. The apology is expected to come in January or February. Police blocked access to a temporary border-crossing in Cornwall, Ont. for more than six hours on Saturday after Akwesasne Mohawks protested what they call unfair treatment by Canada Border Services. 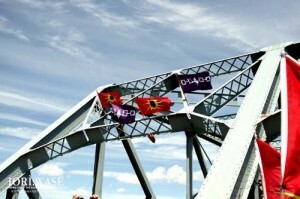 Cornwall police closed the Seaway International Bridge leading to the United States just after 11 a.m. because of a dispute between Mohawks and the government agency. Although the border-crossing remained open, the bridge was closed until just before 5:30 p.m. Those hoping to travel to the United States were being advised to cross the border at Dundee, Que., located 45 minutes east of Cornwall; or Prescott, Ont., about 45 minutes west of Cornwall. No One Is Illegal Vancouver would like to extend our deepest respect and solidarity with the Mohawk Community of Akwesasne for your courageous actions against the arming of Canadian Border Service Agency (CBSA) guards. We recognize that CBSA is a foreign occupier on Akwesasne territories and the arming of border guards is a declaration of war against the sovereignty of your Nation.